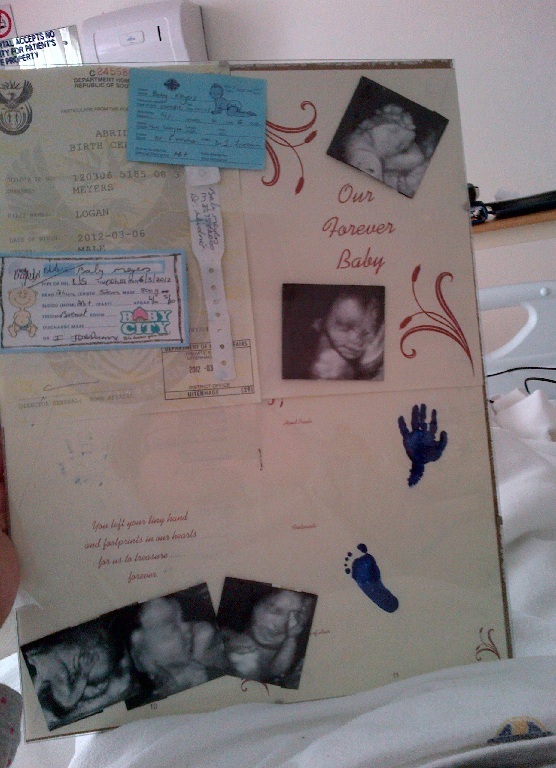 Our baby died, it’s a hard message to convey,surreal, unbelievable, scary. Logan was with us for just a day and a half, that’s it, he was loaned to us and was so special God couldn’t bare to be apart from him. Last time I updated I was soooo excited about doing a 4d scan, we would finally see our little man, and we did, the scan was incredible, the radiographer referred to him as the busiest baby they had ever scanned and definitely one of the cutest, he wriggled around, covered his face, playing peek-a-boo and made both Rob and I melt inside. I left the office on Monday on cloud nine, telling my friend how it was the best day EVER! i received my new phone, saw the scan and was on my way to a early supper with my husband. When I got home I rushed to show scan pictures and videos to my parents who were equally elated. How exciting in a few months this little busy body would be in our arms, but life had other plans. That night I suffered from stomach cramps, it gradually became worse and I had no choice but to go the emergency room. Still convinced i had just eaten something dodge, the doctors set up a few tests, that’s when they found out, I WAS IN LABOUR!! !, I was having contractions and pain set in hard and fast, suddenly I was fully dilated and being rushed to labour ward. Pain and blood that’s all I remember, My placenta had ruptured and with every push all I got was blood clots and pain. My water was broken but was stained green (still waiting for test results) all I knew was I was going to do what doctor said, push through the pain and stay calm. My placenta had ruptured, a rare condition which causes your placenta to become unattached to your uterus, no warning no nothing, suddenly me and my baby were in critical condition. “I want my baby I shouted” but the doctors wouldn’t make eye contact, the message was clear, he was not going to make it. “I want my baby”that’s all i could remember thinking, with Robin at my side, holding my hand and praying non stop, I weaved in and out of consciousness, I had lost a lot of blood and having a rare type, meant more blood had to be rushed from another hospital. In a bid to save our lives they did an emergency cesarean, cutting me from my belly button down, the baby was taken out and I still had no idea how he was, the sad faces around the operating table gave me no hope and I immediately passed out. Rob tells me I wasn’t doing well, weaving in and out of consciousness begging for my baby. I was told Logan was alive and my fight started. My body was weak and extremely painfull, every movement was pure agony, but I was going to do anything to get well for my baby. I took the bare minimum when it came to medicine in a bid to stay awake for him and tried to stay as upbeat as possible. The Tuesday Logan was fine and I was getting better he was kicking around and all diagnoses looked good-my tall handsome boy would be ok, Id see him the Wednesday and sing to him like I did while he was in my tummy, he would hear my voice and be okay. But that was meant to be, despite trying my best, I could not get there in time and my angel was taken away. With my grief stricken family looking on (still amazed that I had made it through)They brought my perfect little man to see me, the spitting image of his father. In every way he had the same fighting spirit as his dad, but his body was just too small, not formed enough, weak as he was, he couldn’t fight off the bleeding on his brain and his organs which gave up slowly after. In a way i think he saved my life, if it wasn’t for him I would never have come to the emergency room (not a fan of doctors) and if I didn’t have him to fight for I would probably have given up on the operating table, but him and his father kept me strong. Still they do, his dad hasn’t left my side except under heavy protest and he has been my pillar of strength. We gave Logan a beautiful send off (They let me out of hospital just in time) and although I’m practically confined to bed the future looks a little brighter each day. A big thank you to all friends and family who have come out to support us in this tough time, your support is greatly valued. . .
a hug from abroad. . . I would love to hold your story at the site as well; if there are particular posts here that you would like to me to use, you can just send the links to those, or you can rewrite your story specifically for the site. Either way, if you just use the "Share Your Story" tab, it'll let you know how to do it. I'd hate to publish something there that you only wanted here. Thank you for visiting stillbirthday, and for sharing your experience so that mothers can find healing and know that they are not alone. Thank you for sharing. Stories like this give hope and strength to many who have gone through this.